Are you thinking of starting an IT business? Then this seminar is for you! We are pleased to inform you that the ICT Davao, Davao United Association of Animators and Designers (DUAAD) and the Startup Davao will be hosting the Davao BizStart 2014 as one of the official side event of the Brunei Darussalam, Indonesia, Malaysia, Philippines – East ASEAN Growth Area (BIMP-EAGA) and the Indonesia, Malaysia, Thailand – Growth Triangle (IMT-GT) Trade Fair and Business Leaders’ Conference 2014 slated on 25 October 2014 at SMX Convention Center, SM Lanang Premier, Davao City. According to NewDeskAsia, the organizers are targeting 500 students, bloggers, media, and business professionals to participate in the BizStart Davao 2014. Since its inception in 2011, DARE BizStart has been structured as a platform for startups. Founded by MAD Incubator from Malaysia, the DARE BizStart platform has continuously aimed to promote the entrepreneurial mindset by bringing potential entrepreneurs closer to the resources they need such as collaborators, suppliers and prospects. It is poised to be the one stop platform for entrepreneurs and would-be entrepreneurs to obtain the latest information, knowledge, skills, expanding their networks and looking for business opportunities in the creative industry. Speakers include Lizabel Holganza, the president of the National ICT Confederation of the Philippines; Mr. Darwin Tan, chairperson of the BIMP-EAGA ICT CEO Forum; and Pengiran Sarimah Pg Hj Abd Latiff, the head of ICT of the BIMP-EAGA Business Council TIICTD Cluster. Topics include Starting a Graphic Design Business, Game Development and Animation, User Experience Design, Branding and Social Media, and Resource Funding for Startups. 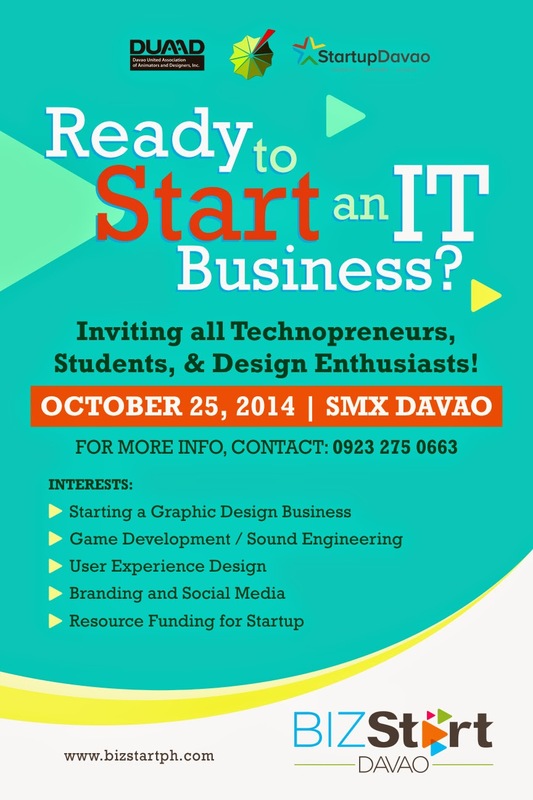 To register for BizStart Davao 2014, visit bizstartdavao2014.eventbrite.com. For more information, contact Ms. Angel Abella, co-organizer of BizStart Davao 2014 at 0927-428-1585 or 0922-212-9696.